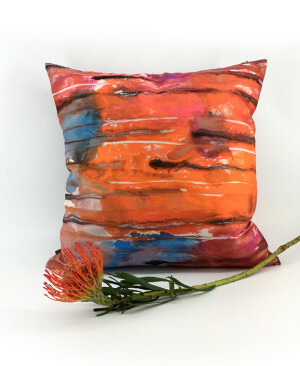 This cushion has a design inspired by the work of Artist Zhouzhou Zhou’s ‘ Abstract Color Ink’ painting. Artist Zhou breaks boundaries and adopts a relaxed attitude towards traditional Chinese painting. He works with ink on rice paper to create a narrative that is imbued with spiritual expression. Brighten up your living room with this elegant cushion featuring a beautiful abstract ink painting and filled with feather and inner peace. 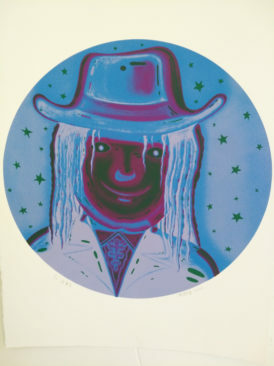 New & exclusive to JE gallery, we are obsessed with contemporary art. Hong Bao was born in 1984 in the city of Shantou located inside the province of Guangdong, China. She obtained her BFA in 2008 from Guangzhou Academy of Fine Arts and proceeded with an MFA, in the same university, that she completed in 2011. Hong Bao’s interest lies in an ancient painting techniques. She engaged in creating mineral paintings and perfected her skills in the research of heavy modern coloured rock. 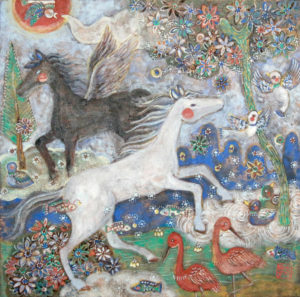 The following painting is full of mystical creatures and landscapes. One of the horses has wings, both of them have red cheeks, just like some of the birds. A characteristic that would normally be associated with humans. The trees are carrying different types of flowers and some them are just floating on the background river. Every element on this piece creates a whimsical atmosphere. The following painting portraits multiple mystical forest animals. A few fish are floating in the air and the trees are covered in all sorts of flowers. 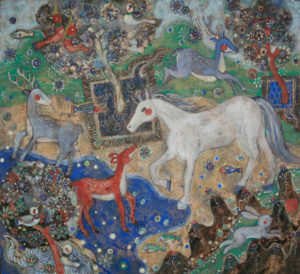 Some of the animals are standing over water adding yet another layer to the fairytale environment the artist is creating. Moon night is a mineral painting. 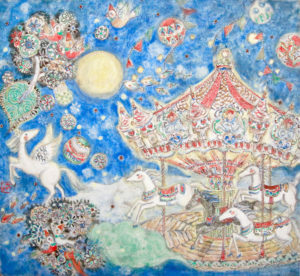 It depicts fairytale creatures, flowers, a carousel, and many different shapes and colours. 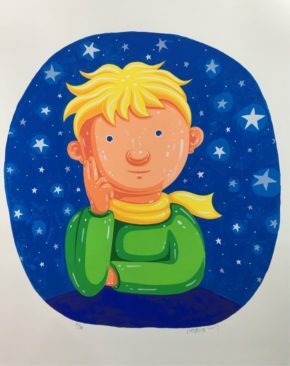 The blue in the background stands for water but also air. Air creatures and water creatures are swimming and flying all together at the same time, in the same mystical environment. 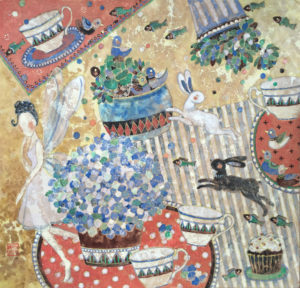 Sweet Secret is depicted on what we could assume is a table ready for an afternoon tea party. Tea cups look like they are dancing away with rabbits, and fish are floating over the table. Flower pots are on the table, full of ducks, and a fairy is standing on the left, looking at us without any face. 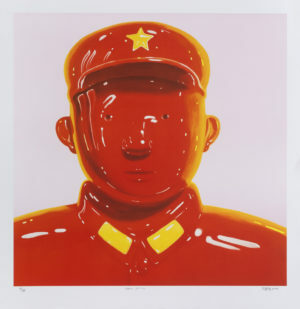 The icon that Shen Jingdong’s “hero” series created, is an image of the soldiers without any personal identity. This image is hardly to tell who the specific soldier is. His facial features are vague, and in fact he is a man in common sense. The clothing and attitude in-which he stands, his identity and individuality are replaced by a common ideology. The image of the soldier which was named hero is out of refinement. They are created into four kinds of people, which are the red, the yellow, the bald and the soldiers with hat. The yellow soldiers possess a hue of humanity, and the red soldiers stand for the solemn atmosphere of revolution. Their bodies are not only dressed in the uniform dress, but also have a fixed correct upright posture. This kind of image comes from his experience in the army. Almost every soldier with an “out of the box”personality will be uniformed in the end after joining the army. “The world is definitely not flawless, you can see famine, war and disaster, but I want to view it in a simplified way, like Michael Jackson. (Sings) We are the world, we are the children. I painted Michael Jackson when he passed away in 2009 because I was a big fan. Actually, my work is always relevant to my way of thinking. 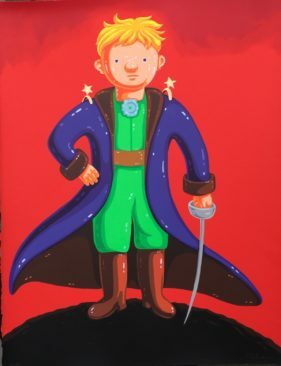 If you look online, I’ve done a video – it’s a drawing of Michael Jackson, doing all his dance moves, but he’s a soldier” — Artist Shen Jing Dong interviewed by Fionnuala McHugh. 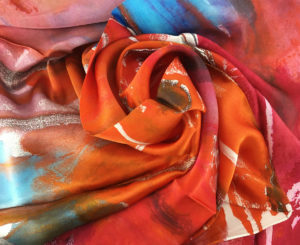 Richly detailed in a extravagant colorspalette, this beautiful silk scarf is inspired by Arist Changliu’s rainbow mountains contempoary ink painting. Artist Liu is a tireless explorer of Art & Culture. She has developed classical Chinese painting skills and embraced modern multiculturalism in her art. Artist Liu experiments with ink and colour to capture surprising moments of beauty. Silk has historically been a prestigious fibre associated with luxury and high status. Merchants transported it along the Silk Road for almost two thousand years and it sold in Central Asia and Europe for fabulous prices. JE Gallery have combined silk and contemporary art and these wonderful products make a fantastic gifts to lovers of art and culture. 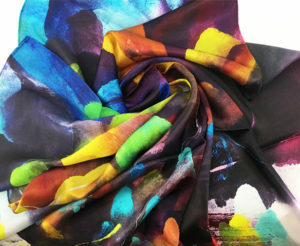 The silk scarves have a design derived from Zhou’s contemporary abstract painting which is vivid and emanates a sense of simplicity and freedom. The silk fabric is an appropriate canvas for Zhou’s luxuriant images and these scarves will without doubt wrap you in warmth and beauty. 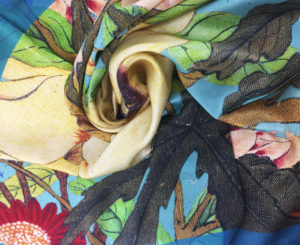 Richly detailed in a extravagant colorspalette, this beautiful silk scarf has a design inspired by the Chinese master ink paintings from song dynasty. The particular piece features okra blossom with yellow creamy petals and a purple velvety inside. It makes a unique gift and wrap you in warmth and beauty. New & exclusive to JE gallery, bring you the best of oriental art & culture.